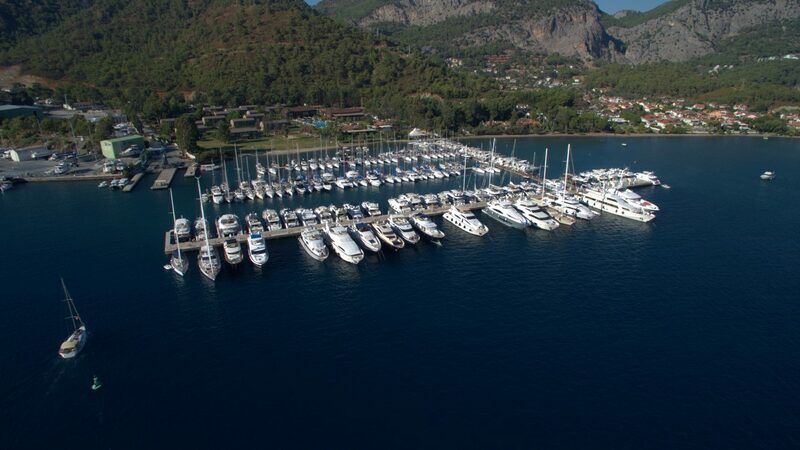 Marinturk Göcek Village Port marina and boatyard are situated in Gocek, a town of Fethiye and only five minutes by walk from the town centre, 20 minutes from Dalaman International Airport. The marina and its experienced staff provide you with 220 berths, some of which are dedicated to mega yachts up to 120 meters at the state-of-the-art new breakwater, the longest of Mediterranean, equipped with 1000 amp. shore power capacity and onsite pump-out. Dry storage parking capacity is 200 yachts. Lifting, launching and many kinds of maintenance services are provided in our boatyard with two travel lifts (75 ton and 200 ton). There is also an indoor area capable of accommodating two yachts up to 45 meters for refit projects. Located next to the marina, Rixos Premium Göcek features 200 elegantly appointed suites set amidst the natural beauty of pine trees and tranquil gardens, a variety of restaurants, fitness and Spa.